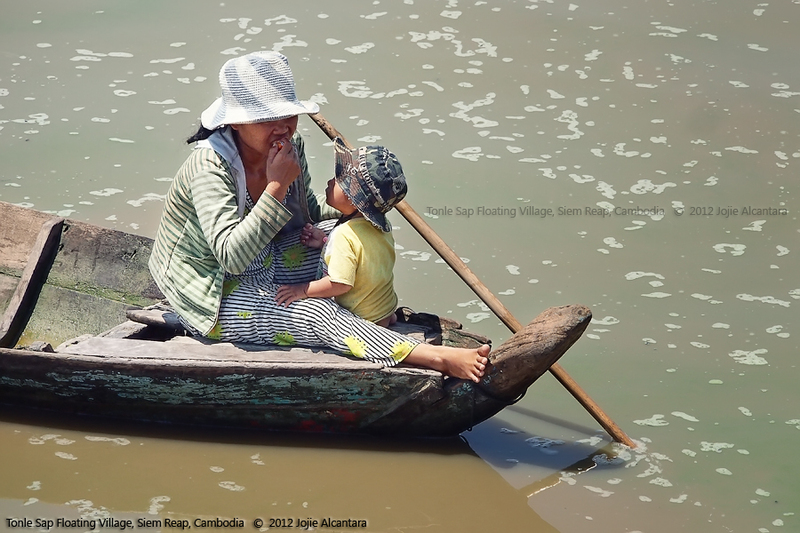 In this tour, I’ve encountered many mothers carrying their babies in tiny boats, begging for food, or selling products to tourist boats. It was heartbreaking, seeing some babies crying from the heat of the sweltering sun. While some were inside makeshift pens and cradles made of cloth, others were exposed to sun, wind and dirty waters, a part of life within the floating community in Tonle Sap. A combined lake and river system, Tonle Sap river becomes the largest freshwater lake in Southeast Asia during the monsoon. In 1997 it was designated as a UNESCO biosphere. The river changes its flow direction twice a year and the lake itself expands and shrinks dramatically between the dry and wet season. During the wet season, Tonle Sap Lake has a surface of 12,000 square kilometers, shrinking to 2500 square kilometers in the dry season. Tonle Sap is one of the most productive inland fisheries in the world, the fish caught here supporting over three million people. Tourists come to this area during dry season for a very fascinating boat tour.